WATERFORD — T.J. Racicot and his team depend on hard work, not bells and whistles. 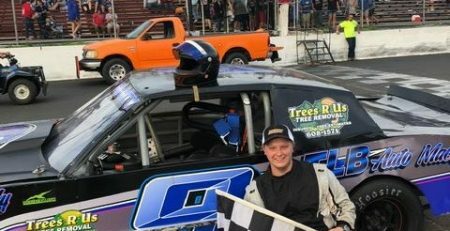 That philosophy turned to gold on Aug. 1 when he grabbed his first careers win at the New London-Waterford Speedbowl just one week after he wiped out the front end of his car in a multi-car accident. Not many drivers can go from the scrap heap to the penthouse in one week, but Racicot was able to do it. The promising night turned into a nightmare when a bolt came loose and it deprived him of all his steering. Racicot’s car, however, looked like it went 15 rounds with Gravedigger and lost. When he returned to action on Aug. 1, however, the car still was woozy from the crash of the week before. 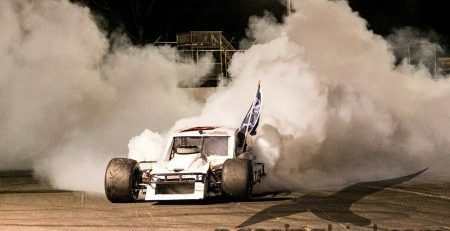 Once the 25-lap feature started, it didn’t take him long to discover he had a pretty good hot-rod underneath him. 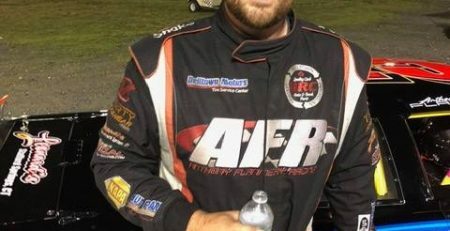 He was in third place with five laps to go when the two drivers in front of him, Steve Olsen and Will Rheaume, got tangled up and veered toward the wall. Racicot was prepared for that sudden turn of events. He swooshed past the two cars while moving into the lead. “All the stars lined up perfectly for me when that happened,” Racicot said. “I saw it coming that those two guys might get together, I just wanted to get around them and not get involved in the accident. What Racicot learned was that point-leader Eddie Loomis was in second place, setting up a four-lap barnburner for the win. “We both drove our butts off,” Racicot said. “Eddie is a great guy. He got into me once but I was able to hold him off. Racicot’s win, however, was more than 30 years in the making. He started as a fan and then worked as a crewmember, starting in the ‘80s when he worked with Brian and Dennis Blaise. “I also worked with Diego and Shawn Monahan,” Racicot said. “Then I worked with Tommy Silva when he had his Sportsman car and he had a lot of success and won Rookie of the Year. I was his one and only crewmember. Then this story heads to Virginia Beach as Racicot decided to start a family. 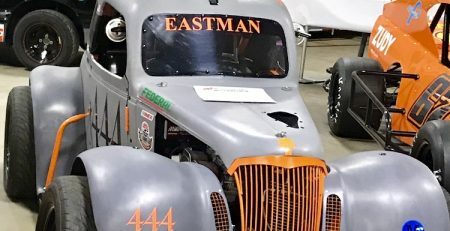 When he returned to Connecticut 10 years later, he jumped back into motor sports as quickly as possible. 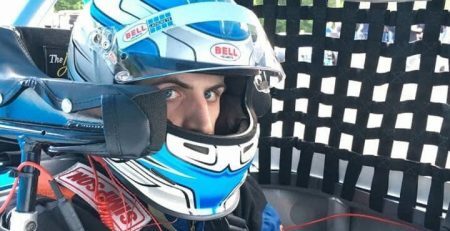 Racicot took the next step in 2017 when his friend Andy Lee gave him his old X-Car. He took the car to Seekonk before the Speedbowl season opened and won a heat race. When the Bowl season got under way, however, Racicot’s luck wasn’t as stable. “Two weeks into the season, we blew the motor,” Racicot said. Racicot purchased a car from Rich Hearn and went back behind the wheel. 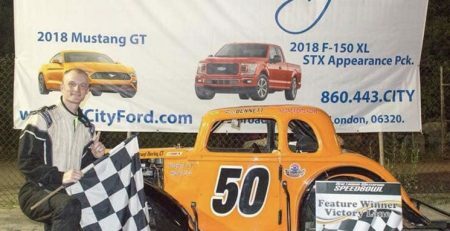 Then in 2018, he bought a car from X-car competitor Onie Pierce, Steve Pinkham worked on the chassis, and Racicot’s career started going places. 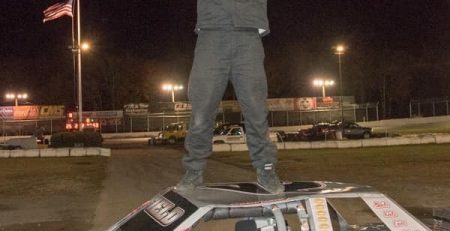 He finished sixth in the season opener, and then grabbed a second place finish on the first Wild and Wacky night of the season. Two months later he was able to grab an even bigger highlight — his first win. Racicot’s sponsor list includes Jiggy’s Smoke and Vape Shop of Waterford, Pinkham Builders, Critical Signs, LaBella Wine and Spirits of Uncasville Shaft Motorsports, Rockin’ Ronnie Barnes, EB Riggers, and Laura Marie of Passing Bird Photography. 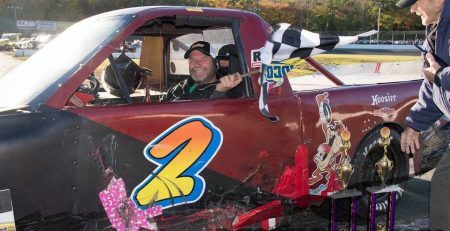 His wife Brooke, and his three kids, Jacob, Lucas and Kylie are a huge part of his racing team along with the Ratch Racing Team of Quarter Bill, Nick, Tyler, Lou Racicot, Caitlyn, Dave Gargaro, Andy Lee and Josh Pray. Racicot also has one of the biggest cheering sections at the Speedbowl. That support has brought out the best in Pacicot. ” In the races I’ve completed, the worst I’ve finished in seventh place, and I have three podiums. Racicot doesn’t need bells and whistles. The first place trophy he won on Aug. 1 is proof of that. Racicot will attempt to make it two wins in a row tonight when Wild and Wacky Wednesday gets under way. The opening ceremonies start at 6:45 p.m., followed by feature racing for the Super X-Cars, the Bandoleros, the Legends and the X-Cars. There will also be a special autograph session for the Bandolero drivers starting at 6:45 p.m.